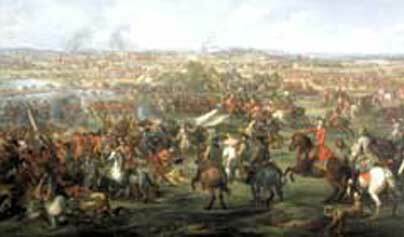 In the course of one bloody summer's afternoon in 1704, around the small Bavarian village of Blenheim, the Duke of Marlborough brought an era of French military dominance to a crashing halt. It was one of the most decisive battles of European history, and it shaped the future of a continent in the space of just a few hours. Yet now, for most, the name Blenheim only brings to mind the baroque splendour of Blenheim Palace, not the battle that saved Europe from tyranny and bigotry. Marlborough's achievement, for which a grateful and adoring Queen Anne rewarded him with the palace, was truly spectacular. His legendary 200-mile march to the Danube in two weeks, conducted in exemplary order and complete secrecy, has gone down as one of the great military manoeuvres of history. It was also one of the biggest gambles in military history, with the fate of ancient empires and kingdoms at stake. On the battlefield itself, Marlborough's calm and courage inspired all around him. But as the Duke himself was first to recognise, it was a triumph shared with the brave, disciplined troops of his polyglot army, and with his ally Prince Eugène. Together, they handed Louis XIV and France a defeat to rank alongside Agincourt and Crécy, and shattered the Sun King's vision of a French super-state. News of the victory was brought to England by a scribbled note on the back of a tavern bill, written in the saddle, and addressed to Marlborough's beloved wife, Sarah Churchill. To mark the 300th anniversary of the Battle of Blenheim, Earl Spencer, a descendant of the Duke of Marlborough and author of a new history of the campaign, tells the story of his ancestor's famous march to the Danube, and the bloody events at Blenheim on 13th August 1704. This two-part series, premiering exclusively on The History Channel UK, will follow in the footsteps of Marlborough's men, using eyewitness accounts and the latest computer animation. Spencer will explain how Marlborough's march wrong-footed his enemies, and how the hopes and ambitions of Europe came to hinge on the actions of mere handfuls of men, near the small Bavarian village of Blenheim.